Bring your favorite Star Wars characters to life with the Star Wars: Episode VIII - The Last Jedi Big Figs Action Figures! 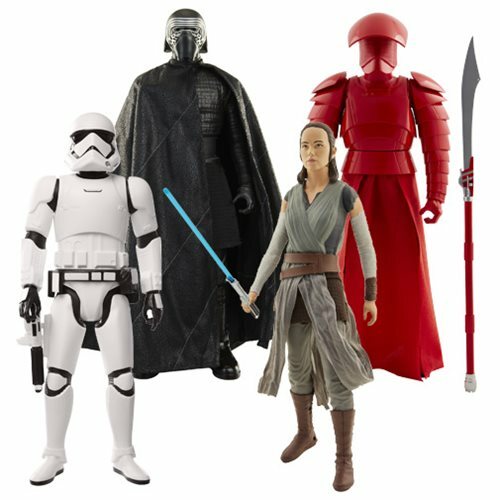 Each detailed action figure brings movie authenticity to your toy box in a big way, giving you your favorite heroes and villains from the film Star Wars: Episode VIII - The Last Jedi! Each figure features at least 6 points of articulation, with most figures sporting a removable accessory. Immerse yourself in the galaxy far, far away with the Star Wars: Episode VIII - The Last Jedi Big Figs Action Figures! Each character stands about 18-20-inches tall and comes packaged in a display tray. Ages 3 and up.